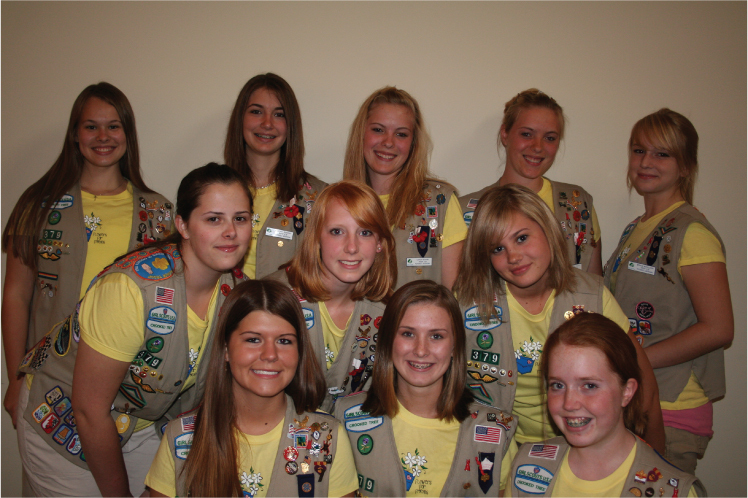 The members of Senior Girl Scout Troop 379 are 16-18 years old and attend Petoskey High School. Troop members include Candace Blandford, Katharyn Burke, Erin Clark, Brittany Cox, Courtney Graham, Lauren Graham, Susie Marvin, Meghan McCullough, Courtney Nicholas, Annika Rettstadt and Brittany Woodard. This year, the troop includes Sittie Angkal, an exchange student from the Philippines. Nine of the eleven members have been together as a troop since first grade. Troop 379 has annually earned the designation of “Honor Troop” from the Girl Scouts of Crooked Tree Council annually since it’s inception. During the spring of 2006, troop members had the opportunity to travel to Our Cabana, in Cuernavaca, Mexico, one of four Girl Scout World Centers. In December of 2007, the Troop was awarded the prestigious Daily Point of Light Award from President George W. Bush and former President George Bush. Members of Girl Scout Troop 379 have been involved in a myriad of service projects spanning the last 11 years. To date, troop members have logged 4000 hours of service as a group and an average of over 400 hours per scout. Some of our most significant service efforts are described below. “Scouts Sort & Salvage” Troop members instituted and carried out a two-year cardboard and tin recycling program at their school, Central Elementary, that was recognized by Emmet County Recycling and the Colgate Youth For America campaign. The project expanded to include other buildings in the Public Schools of Petoskey and continues, to date. As a result of this project, troop members earned their Bronze Award, the highest award in Junior Girl Scouting. “AEDs For Life” In honor of school board recognition month in January of 2005, members of Girl Scout Troop 379 culminated a three year long service project by donating six automatic external defibrillators (AEDs) with adult and pediatric electrodes, 6 wall cabinets and one AED trainer to the Public Schools of Petoskey. Grants provided funding to train or re-certify 100+ staff members in the Petoskey Schools. That training continues. Troop members have maintained their CPR/AED/First Aide certification to date. The scouts were recognized for this project with an American Red Cross Everyday Heroes Award and were one of the five finalists for the Governor’s Service Award in Michigan. As a result of this project, troop members earned their Silver Award, the highest award in Cadette Girl Scouting. “Cookies and Calling Cards” The scouts have forged a special relationship with their sponsor, VFW Post 2051. For the last five years, the troop has assisted the Post with their Veterans Day ceremony and partnered with the veterans in a project to send Girl Scout cookies and pre-paid phone calling cards to soldiers on the ground in Guantanamo Bay, Cuba and Iraq. In year one, the project shipped 10 cases to Guantanamo Bay, the second year, the troop shipped 44 cases to soldiers in Iraq, in year three of the project, 85 cases were shipped and last year 180 cases were sent to soldiers at four destination points on the ground in Iraq along with a battlefield hospital. This year, the project exceeded its goal of 200 cases by shipping 248 cases to nine different destination points in Iraq. In 2008. the project was also supported by a grant from the Bay Harbor Foundation. Troop members have received a National Youth Activities Award and an Outstanding Achievement Citation for this project from the VFW Ladies Auxiliary. To prepare for the " Flowers For Friends" project, Troop 379 completed a significant service project at Bay Bluffs Medical Care Facility in Harbor Springs, Michigan. Troop members spent a day learning about all aspects of plants and then built two handicap accessible vegetable gardens from the ground up for the residents. During the summer season, the gardens have since been producing vegetables for the residents. The scouts also prepared for the project by working with area business owners to learn about all aspects of running your own business. Troop members completed a training called “Dollars and Sense” that reviewed the basics of personal and business finances. In establishing and running the "Flowers For Friends" project, Troop 379 is essentially setting up and running their own non-profit enterprise. Each scout also completed a 40-hour Career Project and a 30-hour Leadership project as a pre-requisite to their Gold Project. Troop members earned some of their Leadership hours by putting on a day-long activity for younger scouts called "Our Cabana Up North". After the troop had the opportunity to go to the Girl Scout World Center in Cuernavaca Mexico, they wanted to show younger girls, who may not have the chance to go there, what that experience was like. Throughout the day, younger scouts went to various stations developed and led by our troop members. Each station represented a different part of the Our Cabana World Center experience. Over 125 younger scouts learned how to salsa dance, made some traditional Mexican art, played some Mexican games, got a taste of churros, and even learned a little Spanish. Troop 379 not only got to educate the younger scouts about Mexico, but also made lasting bonds with the girls.